The International Journal of Business Communication (IJBC) publishes peer-reviewed, rigorous original research that contributes to the knowledge and theory of business communication as a distinct, multifaceted field approached through the administrative disciplines, the liberal arts, and the social sciences. Articles in IJBC address all areas of business communication including, but not limited to, business composition/technical writing, information systems, international business communication, management communication, and organizational and corporate communication. In addition, the journal IJBC welcomes submissions concerning the role of written, verbal, nonverbal and electronic communication in the creation, maintenance, and performance of profit and not for profit business. All individual subscriptions are handled by the Association for Business Communication. Subscribers to International Journal of Business Communication also receive a subscription to Business and Professional Communication Quarterly. To learn more about subscription information click here. The International Journal of Business Communication (IJBC) publishes manuscripts that contribute to knowledge and theory of business communication as a distinct, multifaceted field approached through the administrative disciplines, the liberal arts, and the social sciences. Accordingly, IJBC seeks manuscripts that address all areas of business communication including but not limited to business composition/technical writing, information systems, international business communication, management communication, and organizational and corporate communication. In addition, IJBC welcomes submissions concerning the role of written, verbal, nonverbal and electronic communication in the creation, maintenance, and performance of profit and not for profit business. The International Journal of Business Communication (IJBC) publishes manuscripts that contribute to the knowledge and theory of business communication as a distinct, multifaceted field approached through the administrative disciplines, the liberal arts, and the social sciences. Accordingly, IJBC seeks manuscripts that address all areas of business communication including but not limited to business composition/technical writing, information systems, international business communication, management communication, and organizational and corporate communication. In addition, IJBC welcomes submissions concerning the role of written, oral, nonverbal and electronic communication in the creation, maintenance, and performance of profit and not for profit business. IJBC accepts all rigorous research methods, including but not limited to qualitative, quantitative, and critical. IJBC conducts masked reviews in which the Editor, an Associate Editor, and at least two subject-matter experts examine submitted manuscripts. Traditional scholarly studies of 15-35 double-spaced pages, excluding references, notes, and appendices. Commentaries of 10-14 pages, excluding references, notes, and appendices. Forums consisting of 2-4 articles organized around a unifying theme. Manuscripts comprising forums typically resemble commentaries rather than traditional research submissions. Forums might also have an introduction written by a guest editor. Book reviews. Contact the Book Review Editor to inquire about reviewing a book. Quantitative manuscripts must report estimates of reliability for all dependent measures, variance accounted for in tests of significance, and power estimates when tests fail to achieve significance. Content analysis employing quantitative measures should note intercoder reliability. Survey research should describe the sampling frame (relevant population), sampling method, sample unit, and response rate. Qualitative research must note standards used to ensure the quality and verification of the presented interpretation. Manuscripts should be submitted to http://mc.manuscriptcentral.com/jbc. 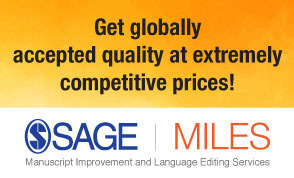 Submit the manuscript and cover page as a Microsoft Word file or a rich text file. Save any figures, tables, or charts in a PDF document, but be sure to include editable versions of these elements. Write the manuscript in English, following the format specified in the Publication Manual Of The American Psychological Association (6th edition). You may use either U.S. or British spelling, but use U.S. punctuation. Remove all personal and institutional identification from the body of the manuscript. Name, institutional affiliation, mailing address, e-mail address, and telephone and fax numbers for the corresponding author. Name, institutional affiliation, and e-mail address for all other authors. One to two sentences for each author’s biography. A statement that the manuscript is original and is not under consideration or published elsewhere. Submit the manuscript as a separate attachment. On the first page of the manuscript, include 1) the title, 2) an abstract of 150 words or fewer, 3) five keywords for online searchability. Start the body of the paper on the second page. Check the paper and references for accuracy. Write clearly and concisely using inclusive language. To hide your identity during the review process, refer to your own previously published research by using the word AUTHOR rather than your name. Submit figures, tables, and charts as a PDF document. Such visuals are often lost when sent in a Word document. Indicate on the manuscript where each visual should be placed. An electronic copy of the article (if not originally submitted electronically). A camera-ready copy of any images. Author notes (e.g., acknowledgments and manuscript history) . A statement showing that you have complied with the principles outlined in Appendix C (Ethical Standards for the Reporting and Publishing of Scientific Information) of the APA, 5th edition.